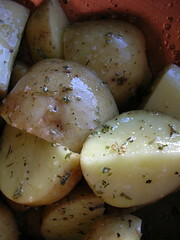 roast potatoes, originally uploaded by shaunaforce. Its pitch black dark outside. Its 5:30 pm. Here we go, descending into the long, dark days of winter. Have you ever noticed how everyone grows just a touch cranky this week? Right after the switch, were all just a little off. (And for those of you reading this outside the US, you have the right to shake your head and wonder why we do this.) When I woke up this morning, groggy from the codeine, I looked outside and saw the saturated, dark-blue sky, ascending into lightness. About right for 7:30 in Seattle these days. And then I looked at my computers clock and realized it was 6:30. Says who? This (and the equivalent day in spring) is the only time I realize in my body just how arbitrary our concept of time is. Its an hour earlier because the government says so? Well, why dont we say its spring and be done with winter? No wonder we all grow a little testy for a couple of days. And besides the existential wondering, its dark at bloody 5:30. It feels like 10 pm instead. Actually, I dont like the transition into it, but I do like winter. I love the way the chill air surges through my skin unexpectedly. I love the clarity of the light in December, when sunny days feel like a welcome blessing. I love the raspy feel of wool socks on my toes, scarves against my throat, and the bulk of my coat on my shoulders. I love the way the darkness presses in against us, and we have no choice but to huddle in closer together, grateful for a flickering fire or a string of white lights in a room. Theres something primal about this season that approaches: I feel closer to myself in the dreary days. And this winter, Im looking forward to all the food. The gratins and stews and cassoulets. The hearty foods. Deeply layered. Meats braised all afternoon. Everything just a bit denser than it was in July. Has anyone else noticed a sudden urge to eat more grains and starches? To slow simmer soups for hours? To eat a little more, a little more frequently? We are, after all, animals. Were preparing for hibernation. (And when it grows dark at 4:30, the way it will be here in Seattle in about a month, I sometimes wish I could just crawl in a cave and sleep until March.) We need to pad up against the cold. Well, I dont want to give into that urge completely. But I have noticed that Im roasting food more often these days. Theres something deeply comforting about a roast. Crispy chicken skin. A big pan full of roasted root vegetables. The coziness of the kitchen with the windows steamed up from the heat. In September, I bought a decent roasting pan at Sur la Table. At the time, I worried it was a bit of a splurge. But today, I saw just how handy that pan is growing. I still cant walk that well. I limp along between the couch and the freezer, fetching ice in hopes my ankle will stop swelling. Slowly, its healing. Im sure that Ill be fine. But after a day of laying down on the couch and eating only TV dinners, I just couldnt do it anymore. I had to cook something. So I dragged a small stool over before the oven and propped my green-and-blue ankle upon it. (If you really have to see it, you can click here. But I’m warning you.) I figured I had about seven minutes before my ankle just gave out and forced me back to the couch. And I still had some vegetables left in my Pioneer Organics box. What could I do, fast, that would still leave me feeling as though I had cooked? This isnt a revelatory recipe. It isnt at all complicated. Im sure youve all made them yourself. But for this hobbled, gluten-free girl, these roast potatoes hit the spot. 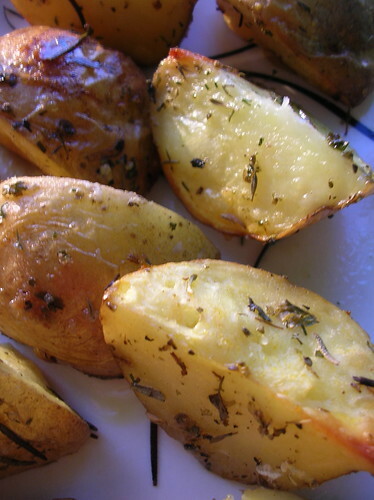 And if it has been awhile since you made some, pull out some little Yukon gold potatoes and start pinching sea salt, adding pepper, and dousing it all in olive oil. In half an hour, the smell will knock you out. And the taste? Crunchy crisp on the outside, starchy softness inside. Ah. °Cut the potatoes into quarters. Throw the pieces into a copper bowl and douse with the olive oil. Toss. °In rapid succession, sprinkle on the sea salt, herb de provence, and pepper. Toss again. °Throw the whole lot into a quality roasting pan. (Line with tin foil if you want to avoid the clean-up.) Lay the rosemary skewers on top, haphazardly. °Put into a 425° oven and roast for about 25 minutes, or until the potatoes are soft to the touch when pricked with a fork. Shauna, I just read about your accident. What horrendous timing! Then again, a large part of me believes that everything happens for a reason, and maybe the universe felt you needed a few restful days to yourself instead of a chaotic mad-dash around NYC 🙂 …at least it makes us happy to have so much more from you to read! Poor Shauna, I DID check out the photo of your ankle – yikes!!! Hope it heals quickly. As for turning the clocks back…I just shake my head. Now I hear that you guys (US) are going to be doing it later than the rest of the world (the part that does this anyway) and we Canadians will follow (as usual). Hello there, m’dear. So glad to see that you’re at least able to hobble around enough to roast potatoes! Of course, I knew you wouldn’t go hungry, and between the lovely spinach and those outrageously good caramels (yes, I too am a fan), it looks as though you’ve been eating better than many of us without sprained ankles! But get back to the couch and elevate that thing. Grrr. I hope your ankle is feeling better soon. All the food looks wonderful. Thanks so much for all the links to other great recipes, you continue to make my quest into the gluten free zone a joy. Oh My God! I got busy and you went and smashed your foot up into a bruised and battered mess! I think I’m going to have halloween foot nightmares! You poor girl! Your mention of the nice old lady lending you her cane made me laugh outloud. I do hope you get well soon – do you find out tomorrow about what exactly you did to your foot? Lots of good vibes for you from Oregon (and get well wishes!). I just finished off a package of Fran’s grey salt truffles myself not long ago and I agree completely about how wonderful they are – but I had no idea they were in Seattle! When you are finally able to take that tour (and you will be able to sooner than you think, I bet), I can’t wait to hear about it. Take care of yourself – I’m glad you have so many friends to help take care of you while you’re down! I hate daylight savings time too. I hate it even more in the spring when we have to spring forward. Why can’t we leave it alone. My school is wanting to get a new federal law passed making Halloween the last Saturday in October. We hate having Halloween on school days. Thank you, my dear. I’m happy to provide you with more reading. Now, when are you coming back to Seattle? I’ll happily share my gray salt caramels with you. I’m so sorry that you Canadians have to follow our lead on this one. Poo. And yes, the foot has been rainbow hued! Yum. That sounds great. Normally, I would have covered them in garlic. I guess I had to save something for next time. Ah shucks, that was just the codeine talking. You could use any bowl you want. And my copper bowl? I found it for two dollars at Granny’s Attic, the senior citizen thrift store on Vashon. I WISH I had fancy kitchen wares. And I’m sure you have more than me, my dear. I know. I always hated that as a kid too.